Design ideas for an expansive traditional enclosed home cinema in Las Vegas with multi-coloured walls, carpet, a projector screen and brown floors. Inspiration for a large classic enclosed home cinema in Salt Lake City with beige walls, medium hardwood flooring and brown floors. Inspiration for a large traditional enclosed home cinema in Atlanta with beige walls, carpet and a projector screen. 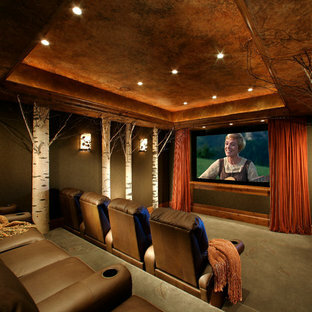 Photo of a large classic enclosed home cinema in Minneapolis with brown walls, carpet and a built-in media unit. 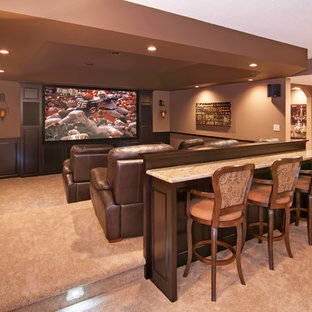 Large traditional open plan home cinema in Omaha with carpet, beige walls, a projector screen and beige floors. Design ideas for a large traditional enclosed home cinema in Salt Lake City with beige walls, carpet, a projector screen and multi-coloured floors. Design ideas for a traditional home cinema in Los Angeles with carpet. 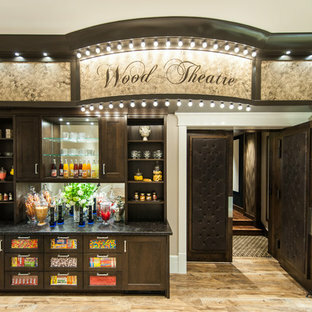 Photo of a classic enclosed home cinema in Dallas. Design ideas for a large classic enclosed home cinema in Portland with carpet. 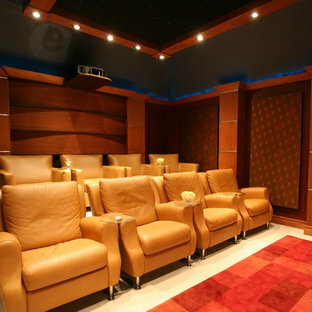 Medium sized traditional enclosed home cinema in Los Angeles with carpet, a projector screen, brown walls and beige floors. Photo of a traditional home cinema in Other with black walls. Inspiration for a classic home cinema in DC Metro with a projector screen. Inspiration for a large traditional open plan family and games room in Omaha with a game room, brown walls, carpet, beige floors and no fireplace. Design ideas for an expansive traditional enclosed home cinema in Orange County with carpet, a projector screen, brown walls and multi-coloured floors. Theater room designed for customer with LED pin light ceiling. In cabinet Klipsch theater speakers, automatic curtains on screen and windows, 106 inch Prjection screen. Controlled on control 4. 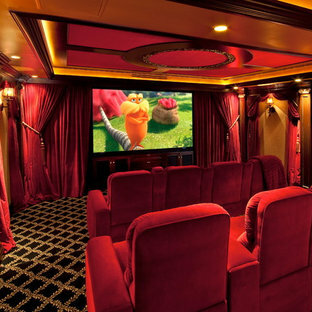 Traditional enclosed home cinema in Cincinnati with red walls, carpet, a projector screen and red floors.